The life of an insurance salesman and former police officer (Liam Neeson) is derailed one day when he is unexpectedly fired. At the commuter-train station, his wallet and telephone are stolen. As if this were not enough, he is approached by a mysterious woman (Vera Farmiga) who offers him $100,000 to identify someone on the train who “doesn’t belong”. Facing a double mortgage, his son’s impending college costs and unemployment, Neeson agrees but then has second thoughts. He isn’t allowed off the ride so easily, however, and he has to see this adventure to the end of the line. 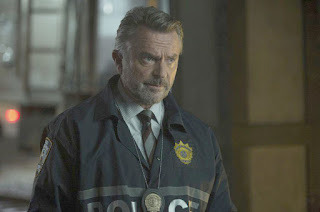 Since he became an action-hero at the age of 56, in the film Taken, Neeson has starred as the unlikely protagonist in a string of such thrillers, four of them now under the same director. Some have been better than others, and The Commuter probably fits right in the middle. Undoubtedly, its plot is similar to that of Non-stop, and is terribly contrived – though, to be fair, the last two minutes suggest that the contrivance was deliberate. The villains are a bit too omniscient here, able to prevent Neeson from leaving the train or calling for effective help, and there is that moment, too often found in such movies, at which the viewer might ask, “Why didn’t the villains do that at the start?” But I am someone who finds no problem with such stories as And Then There Were None, also very contrived, but very good, even so. 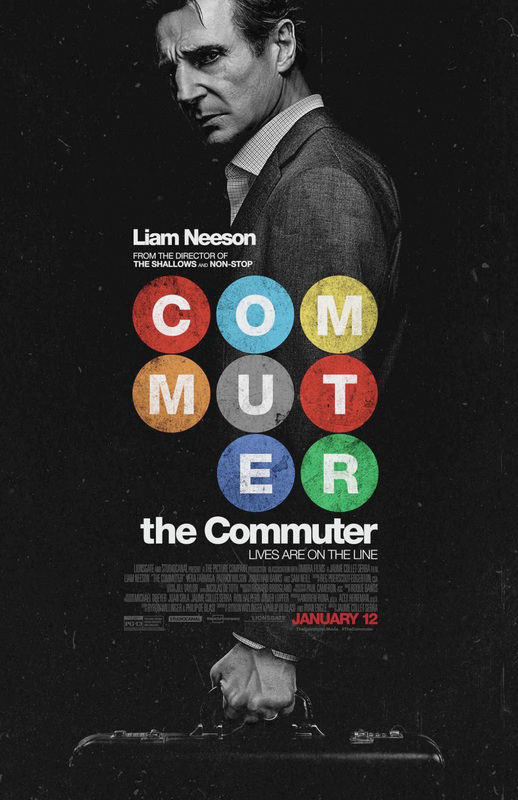 The Commuter isn’t very good, and it will likely divide audiences into those who, well, not love it or hate it – it won’t engender such strong feelings as that – but who like or dislike it. The writing does generate tension. The fight scenes are exciting and, at 66 (playing six years younger) Neeson fortunately is shown receiving more punishment than he gives. But what he goes through is not impossible for a reasonably fit sixty year old. In fact, though, he generally looks suitably tired and weary, not at all dreading retirement, feelings suggested by the chronological montage with which the film opens. The direction weaves from the effective to the pointless. There are a number of camera tricks (the old zoom-in-while-panning-out to create the effect of a tunnel was done to death in the 1980s) that seem to be straight out of film school. And the crash scene, which occurs about two thirds through the movie is created, not quite successfully, with computers. I much prefer the use of models or life-size mock-ups (remember the unbeatable train wreck in The Fugitive?). 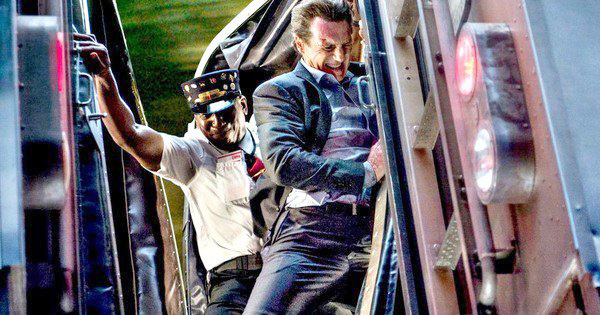 The scene in The Commuter was included probably because it was thought that people would be disappointed if it didn’t happen, or because it was in the budget. In any case, it is fortunately not the climax. The acting is very good, as may be expected from the performers. Neeson has been called lately the new king of the B-movies. This is unfair, since a number of his recent films have been otherwise. But, discounting the money that went into The Commuter, it might qualify, as this is the sort of story, with its Heath Robinson plot and commendable performances, that would fill cinemas in the 1940s and ‘50s. Neeson is the heart of the show, with Farmiga cool and ruthless – initially rather adorable – as the instigator of proceedings. Sam Neill has a small part as a police captain, and Elizabeth McGovern, too infrequently seen in films, is the infrequently seen wife of the hero. While The Commuter, then, may travel familiar territory, and take an unnecessarily winding route, it is worth the price of a seat for a Saturday night’s ride. Great review. I enjoyed him in the Taken movies so I will give this a try. Thank you. 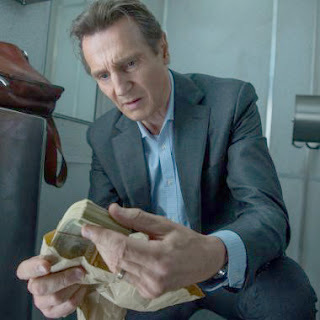 I liked Neeson in "Taken" as well; he seems a protagonist with whom a viewer almost immediately sympathises. I've been thinking about watching this one. I like Liam Neeson but think he might be getting a bit too old for the run and chase type of action movie. I recall your review of "Taken 3", and you thought he looked tired in it. 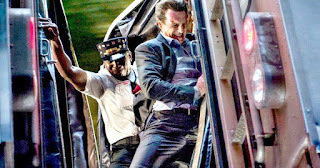 I think he probably is too old for such strenuous activity, but at least in "The Commuter", while he has several fist-fights, the train does most of the high-speed running.